Men’s Basketball: The second installment of the “Battle of Brooklyn”, takes to the Barclays Center this afternoon where the Terriers look to improve to 2-0 against rival LIU Brooklyn. What seperates the good teams from the great teams is how they respond respond during their darkest hours. The Terriers have quite possibly faced that darkest hour with the suspension of four players for an alleged violation of school policy. The Terriers are in the midst of their best season in years, sitting in third place with a (15-10, 6-4 NEC) record. Despite the recent events that have overshadowed their success, there is still basketball to played and the Terriers must get back on the right track if they want to make any noise in the NEC tournament. After an ugly defeat at the hands of first place Robert Morris, the Terriers have a chance to redeem themselves this afternoon in the Barclays Center where they take on their bitter rivals the LIU Brooklyn Blackbirds. This will give the Terriers the perfect opportuity to get back on track and possibly make up some ground in the NEC as they are currently four games behind Robert Morris. A win today would be huge for the Terriers, as it might quiet down all the recent negativity that has been brought to the team due to the suspensions of Brent Jones, Wayne Martin, Anthony White and PJ Santavenere. The Terriers did not look like themselves in their last ball game, which was the result of having a depleted roster. Guys had to play out of position in order to fill the roles of their suspended teammates. Today the Terriers may get two of the four back, those two being starting point guard and floor general Junior Brent Jones. The other being super Freshman Wayne Martin. Both have played significant roles for the Terriers and are a big part of what they did all season long, potentially having the two back for this game would give the team a huge boost. These two teams last meet on January 9th, where the Terriers took care of business at home knocking off the Blackbirds 78-64. Senior guard Ben Mockford led the way for the Terriers as he put on a shooting clinic. He scored a career high 30 points, shooting 11-18 from the field and 8-14 from behind the arc. Junior forward Jalen Cannon was on point as usual, he scored 19 points and grabbed a game high 14 rebounds. The story of this affair was the battle on the boards, in which the Terriers dominated. They outrebounded the Blackbirds 52-28, 26 of their 52 rebounds were offensive which resulted in a number of second chance opportunities. The Terriers were also able to control Blackbirds Senior guard Jason Brickman, who scored 6 points on 3-10 shooting. He was able to dish out 11 assists but he was not able to get to the basket which is a focal point of his game. The Balckbirds were led by Junior forward Landon Atterberry who scored a team high 19 points. After three consecutive seasons in which the LIU Blakcbirds have won the NEC championship, this year comes as a major disapointment. They are (7-16, 2-8 NEC) on the season. They have certainly missed Senior forward Julian Boyd, who tore his ACL for the second time back in September. 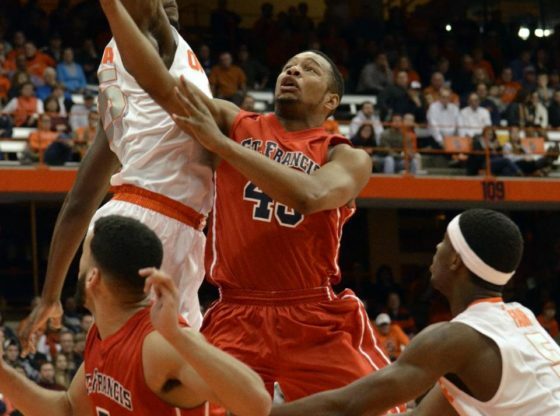 The Terriers need to replicate their first peformance against LIU Brooklyn. They did everything they possible can do right in order to win that game, whether it was Mockford getting hot from three, Cannon causing havoc down low or a valiant team defensive effort. They did everything that needed to be done in order to win. Today’s game can be seen on the MSG Network as well as on Fox College Sports. Opening tip is set for 4 pm and we should see a hard fought battle between two long time rivals. It can’t be said how big this game is for the Terriers basketball program. A win today will give this team something positive to build around since they have been surrounded by nothing but negative things this past week.